A few days ago, the Argentine Navy broadcast a video showing a plane affected by the task of maritime patrolling and a huge number of fishing vessels of different nationalities, in full squid fishing task a very short distance from the outer limit of the Exclusive Economic Zone Argentina (ZEEA). Although on that occasion the detected vessels were not in violation, their proximity to waters with exclusive economic sovereignty of Argentina constitute a warning light. Is that many of these ships do not hesitate to enter the area that is closed to them, following the schools that permanently enter and leave it. Just a couple of days later, Prefectura Naval Argentina also broadcast images. 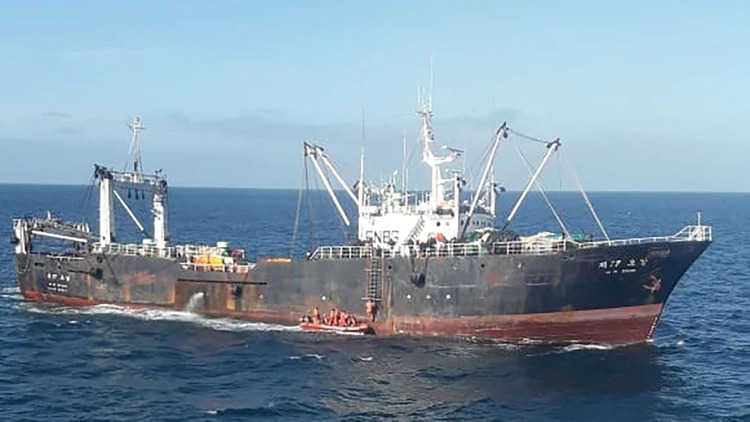 In this case it was those corresponding to the pursuit and capture of the fishing vessel (B / P) OR Yang 77 , a ship of South Korean flag of 60 meters of Length (long) and 10.80 meters of width (width) that was operated by 45 crew members, including their Captain. Contrary to what is common practice in this type of “pirate” craft, the captain of the ship complied with the verbal order of arrest issued from the coast guard vessel “Mantilla” (GC-24) and did not attempt to flee . In the same way, the personnel of the National Maritime Authority ordered that the “fishing gear” not be touched because, surprised in the middle of the task, documenting the operating status of the fishing vessel is fundamental. During the afternoon of yesterday, the Prefecture broadcast for the first time a video that shows the general state of O Yang 77 while it is being held in the overseas pier of the port of Comodoro Rivadavia. Within the tasks that are carried out under current regulations, the PNA must calculate the illegal fishing existing in the ship’s holds. As a rule, when a ship is caught fishing in Argentine waters, it is presumed that all the fish found inside it was illegally fished, beyond which a part may have been caught in the open sea. The diffused images allow to appreciate sealed compartments and uniformed personnel in dock and on board. At this moment, a permanent guard of the Prefecture is in charge of the ship , notwithstanding that all the crew is on board. Since there was no resistance to detention, there is no criminal offense to impute to them. You can even appreciate the foreign personnel moving freely inside the fishing boat. Notwithstanding the fine to be borne by the owner of the ship, to which all the necessary expenses for the capture and transfer to port of the offending vessel are added, a frequent problem awaits him. Argentina has the character of the “Rector State of Puerto” through the Naval Prefecture. In practice, this indicates that the country has the power to determine whether the general condition of the vessel and the ratings that its captain, officers and crew may have are within the respective international regulations . If this does not happen, Argentina must retain the ship in port until the failures are rectified. It would not be the first time that the owner of a boat of this type leaves the ship and its crew to be the cost of repair far exceeding the fine and the value of the ship together. Contrary to what is commonly believed, illegal fishing does not constitute an offense under the Penal Code, but only a violation of the Federal Fishing Law 24,922, which only fixes fines for this activity. A high source of Prefectura in dialogue with Infobae sums up: “The resistance to authority, the flight and, as sometimes happens, trying to ram the infringing ship into the coastguard trying to apprehend, it is a crime Federal Government and authorizes all the procedure foreseen for these cases, which includes the execution of intimidating shots carried out in such a way as not to cause damage to the crew members “. These days, various media and referees of the fishing sector have raised their voice demanding reforms to the current regulations. “If a ship is apprehended under current legislation, it obtains not only payment facilities to pay the fine, but also can choose to buy the illegally obtained cargo at base price,” says a reference in the sector. Usually these furtive vessels at the completion of their cargo will choose it (transfer) to mother ships that in all cases remain outside the 200 miles of the ZEEA. 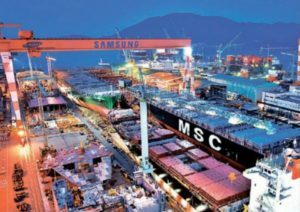 In these ships the merchandise is processed, packed and taken to the Asian or European markets as it is. The fishermen, meanwhile, usually spend large periods of time outside their ports of registration and use places like Montevideo to make provisioning and repairs . The claims of the national authorities to their peers from the neighbouring shore are reiterated, so that the severity of controls on these ships is increased, before allowing them to go back to sea. Last days Infobae warned about the discomfort generated in the sector by the decision of the Undersecretary of Fisheries, to embark on board the fishing research vessel “Víctor Angelescu” under the INIDEP (National Institute of Fisheries Research and Development) of two English scientists to participate together with their Argentine peers in a fishing prospecting campaign. The task of the INIDEP is precisely to determine the state of the stocks of the different species of fish with commercial interest and to recommend to the fishing authorities what are the maximum annual catches that each species supports in order not to be in danger of extinction. With this information, different fishing permits are granted to companies that operate legally. Beyond the initial discontent, recent statements by the British ambassador in Buenos Aires, Mark Kent, emphasize the need to work jointly with Argentina in the control of illegal fishing and over exploitation of fishing. A short time ago, together with the Argentine Foreign Minister, the diplomat authorized the signing of a new version of the “fishing subcommittee”, a bilateral organization with scientific functions regarding the control of the fishing resource in the South Atlantic. “The English interest is evident, Malvinas has fishing as its main source of income, they are not going to allow the few resources that our country has to control the resource, lead to a decline in stocks that endanger the main Kelper income source “, indicate from the guild of fishermen. In the coming days, the Undersecretariat of Fisheries will be able to assess the fine that will apply to the South Korean ship. Sources of the sector estimate it in little more than 250,000 dollars. It will be necessary to see if the shipowner honours his obligation, or ends up abandoning the ship and its crew, which usually ends up constituting a new detriment for the country.